If the exterior of your home is clad in siding – aluminum, wood, asbestos, or fiber cement – there may come a time when you want to replace it. Older siding can become faded or damaged over time, and replacing just a few boards would show an obvious difference in color between the new and old boards. Wood siding may become rotted from moisture damage, or cracked from years of expanding and contracting from moisture and humidity changes. You might be tired of the regular maintenance required for wood siding. Or maybe you’re ready to change and update the look of your home. Whatever your reason, when you decide to undertake a siding replacement project you should educate yourself on the process. First and foremost, the siding you choose will protect your home from the elements like rain, snow, and wind. New siding should also complement the style of your home, highlight architectural features, and improve the curb appeal. To protect the structural bones of your home, you need to be sure the proper materials are installed under the siding itself. Water penetration can be devastating to your home. If water is allowed to penetrate the exterior barrier, it can possibly go unnoticed for months or even years. It can cause the wood framing and sheathing to rot, can find its way deeper inside and damage your walls, and allow dangerous mold to grow. It’s important that your siding installers wrap your home in a watertight house wrap. Another option is a breathable membrane wrap that keeps water out but allows air to circulate. How will the actual process go for your siding installation? You should expect the project will take longer than one day for a typical home. Work with your installation contractor to figure out how long to expect them at your home. Before they begin work, inspect the siding materials to be sure they are the proper style and color you ordered. This is a good time to let the installer know if you have any plans to replace exterior light fixtures, door bells, or house numbers that might require modification in the way they install the siding in those areas. A reputable company will ensure proper cleanup is done throughout the process, even when the project takes multiple days to complete. Any construction debris can be hazardous to the occupants of your home, so cleanup should be done at the end of each day throughout the project. Depending on how much of your old siding is removed, a dumpster may be brought to the site for debris removal. Once the job is complete, be sure to walk around the entire house with the installers. They should ask you to inspect all work areas to make sure you are 100% satisfied with the installation as well as the clean up. They should also talk to you about the proper care and cleaning of your siding. One final note: be sure you’re clear about the warranty on your new siding. 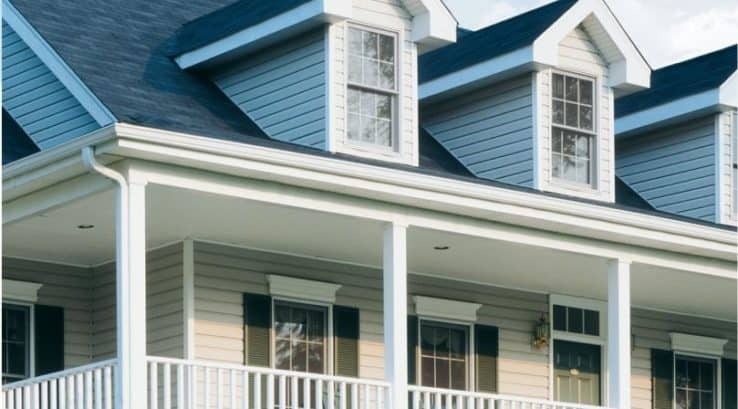 Vinyl siding is one of the most durable materials you can choose, and most warranties are for at least 30 years, with many warrantied for 50 years. A good warranty should cover the labor and installation work as well as all materials. Any warranty that covers only a short period of time or doesn’t address potential problems in the future due to installation should be seriously reconsidered. We’re glad we could help you with your gutter research! We’re glad we could help! With the home that I live in now, I think it would be a good idea to get the current siding replaced. There are a few spots where it’s falling off or missing and it really doesn’t look good. Now I don’t think that I could do it myself, so I would for sure have to get someone to come and do it for me. Seeing as you mentioned that the siding helps protect the exterior of your home, I wouldn’t want mine to get damaged or run the risk of potential damage. Absolutely, Caden. We are happy you found our post helpful! I love what you said about being sure the proper materials are installed under your home’s siding. Hiring a contractor to administer repairs to your siding is the best way to go because they have significant experience. If I were to notice damage on my own home, I would waste no time contacting a service to fix the problem quickly and efficiently. We are happy you found our post helpful, Sam! Pointing out that I should educate myself on the process when I decide to replace my window sidings is great advice to hear. I do agree that I need to be sure the proper materials are installed under the siding itself as you mentioned so that the services I’ll hire can guarantee that they did a decent job. If a reputable company will ensure proper cleanup is done as you suggest, I’ll consider hiring those willing to do the job for next week’s renovation project. The siding on my house is very worn and isn’t doing its job anymore. I’m wanting to get new siding installed and want to make sure I get the right contractor to do it. Thank you for suggesting that I should make sure the right materials are installed under the siding. I’ll have to keep this in mind as I search for the best roofer in my area. I really like that you point out that you should work with your contractor to determine how long your siding will take to be installed. My husband and I are wanting to get the siding on our house repaired and need to find the best contractor. I’ll have to do some research and find the best guy in our area. That’s god to know that a siding installation will take longer than a day. My siding is cracking in places, so I’m looking to repair it,. I’ll have to find a company that’s nearby so they can start working on it soon since it’ll take awhile to fix. My sister was cleaning the exterior of our home when she noticed that the siding looks worn out. It was explained here that it will be best to work with an installation contractor when considering replacing the sidings. Furthermore, it’s recommended to hire professionals for quality siding installation.